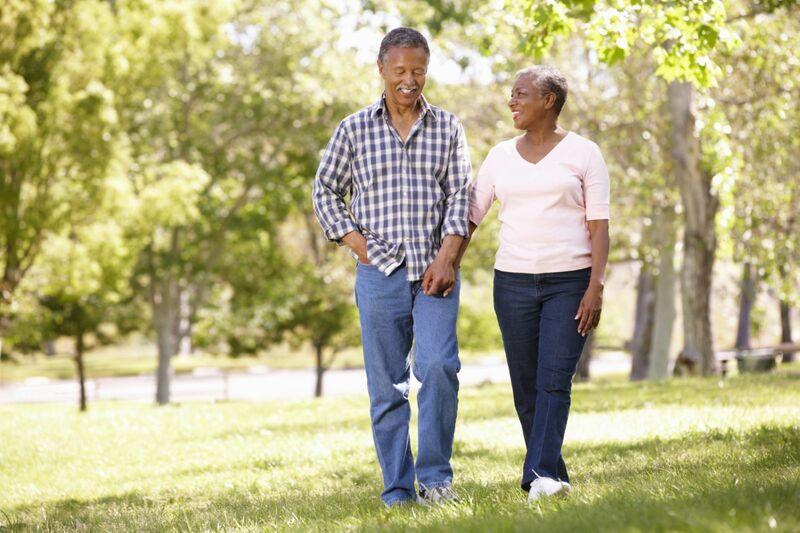 Walking is the most popular physical activity among adults, and it’s easy to see why. It requires no special clothes or equipment, and it’s free. Make walking fun by going to places you enjoy, like a shopping center or park. Bring along someone to chat with, or listen to some of your favorite music (but keep the volume low enough to hear the sounds around you). Think about safety as you plan when and where to walk. Walk with others when possible, and take a phone and ID with you. Let someone know your walking time and route. If it’s dark outside, wear a reflective vest or brightly colored clothing. And always be aware of your surroundings. Physical activity does not have to be vigorous or done for long periods in order to improve your health. A 2007 study of inactive women found that even a low level of exercise around 75 minutes per week improved their fitness levels significantly, when compared to a non-exercising group. Walking can also increase your lung capacity. When you walk, you breathe in more oxygen as compared to when you are stationary. This exchange of oxygen and carbon dioxide at a larger volume can help increase your lung capacity, thereby increasing your stamina and exercise performance . The best part is, you don’t even have to run. A medium-paced 60-minute walk (with breaks, if you need them!) can do the trick. Walking in the morning is a great opportunity for your body to produce vitamin D. Vitamin D is essential for bone strength and it prevents cancer, multiple sclerosis, and diabetes type 1. So, it is very important that you get at least 10-15 minutes of morning sun exposure, and walking is a great way to do so. Walking also helps to increase your creativity. It helps calm your nerves and relaxes your brain. When you walk, you don’t have the pressure of a deadline or meeting a certain expectation. This helps your brain to think strategically and in a more sorted way. So, if you are stuck with a problem, take a walk! Walking can help you build social support and make new friends who will encourage you to walk every day. You will look forward to meeting them. Also, you can walk to support a social cause. At the end of the day, you will be filled with positive energy and peace. It is clear from this list that walking can improve your health in many ways, but what preparations do you need to make if you want to start walking? Explained in the next section. 6) It counteracts the effects of weight-promoting genes. Harvard researchers looked at 32 obesity-promoting genes in over 12,000 people to determine how much these genes actually contribute to body weight. They then discovered that, among the study participants who walked briskly for about an hour a day, the effects of those genes were cut in half. 7) It helps tame a sweet tooth. 8) It reduces the risk of developing breast cancer. 9) It eases joint pain. Several studies have found that walking reduces arthritis-related pain, and that walking five to six miles a week can even prevent arthritis from forming in the first place. Walking protects the joints especially the knees and hips, which are most susceptible to osteoarthritis by lubricating them and strengthening the muscles that support them. 10) It boosts immune function.